, archbishop of Canterbury, was son of William Laud, a clothier of Heading, in Berkshire, by Lucy his wife, widow of John Robinson, of the same place, and sister to sir William Webbe, afterwards lord-mayor of London, in 1591. His father died in 1594, leaving his son, after his mother’s decease, the house which he inhabited in Broad-street, and two others in Swallowfield; 1200l. in money, and the stock in trade. The widow was to have the interest of half the estate during her life. She died in 1600. These circumstances, although in themselves of little importance, it is necessary to mention as a contradiction to the assertion of Prynne, that he was of poor and obscure parents, which was repeated by lord Say, in the house of peers. He was born at Reading, Oct. 7, 1573, and educated at the free-school there, till July 1589; when, removing to St. John’s college, in Oxford, he became a scholar of the house in 1590, and fellow in 1593. He took the degree of A. B. in 1594, and that of master in 1598. He was this year chosen grammarlecturer; and being ordained priest in 1601, read, the following year, a divinity-lecture in his college, which was then supported by Mrs. Maye. In some of these chapel exercises he maintained against the puritans, the | perpetual visibility of the church of Rome till the reformation; by which he incurred the displeasure of Dr. Abbot, then vice-chancellor of the university, who maintained that the visibility of the church of Christ might be deduced through other channels to. the time of that reformation. In 1603, Laud was one of the proctors; and the same year became- chaplain to Charles Blonnt, earl of Devonshire, whom he inconsiderately married, Dec. 26, 1605, to Penelope, then wife of Robert lord Rich; an affair that exposed him afterwards to much censure, and created him great uneasiness; in reality, it made so deep an impression upon him, that he ever after kept that day as a day of fasting and humiliation*. He proceeded B. D. July 6, 1604. In his exercise for this degree, he maintained these two points: the necessity of baptism; and that there could be no true church without diocesan bishops. These were levelled also against the puritans, and he was rallied by the divinity-professor. He likewise gave farther offence to the Calvinists, by a sermon preached before the university in 1606; and we are told it was made heresy for any to be seen in his company, and a misprision of heresy to give him a civil salutation; his learning, parts, and principles, however, procured him some friends. His first preferment was the vicarage of Stanford, in Northamptonshire, in 1607; and in 1608 he obtained the advowson of North Kilworth, in Leicestershire. He was no sooner invested in these livings, but he put the parsonage- houses in good repair, and gave twelve poor people a constant allowance out of them, which was his constant practice in all his subsequent preferments. This same year he commenced D. D. and was made chaplain to Neile, bishop of Rochester; and preached his first sermon before king James, at Theobalds, Sept. 17, 1609. In order to be near his patron, he exchanged North Kilworth for the rectory of West Tilbury, in Essex, into which he was inducted in 1609. The following year, the bishop gave him the living of Cuckstone, in Kent, on which he resigned his fellowship, left Oxford, and settled at Cuckstone; but the un-healthiness of that place having thrown him into an ague, he exchanged it soon after for Norton, a benefice of less value, but in a better air. She was divorced by the eeclesiastical judge for adultery and Laud yielded to the instances of his patron in the opinion, that in case of a divorce, both the innocent and guilty may lawfully re-marry. | In Dec. 1610, Dr. Bnckeridge, president of St. John’s, being promoted to the see of Rochester, Abbot, newly made archbishop of Canterbury, who had disliked Laud’s principles at Oxford, complained of him to the lord-chancellor Ellesmere, chancellor of the university; alledging that he was cordially addicted to popery. 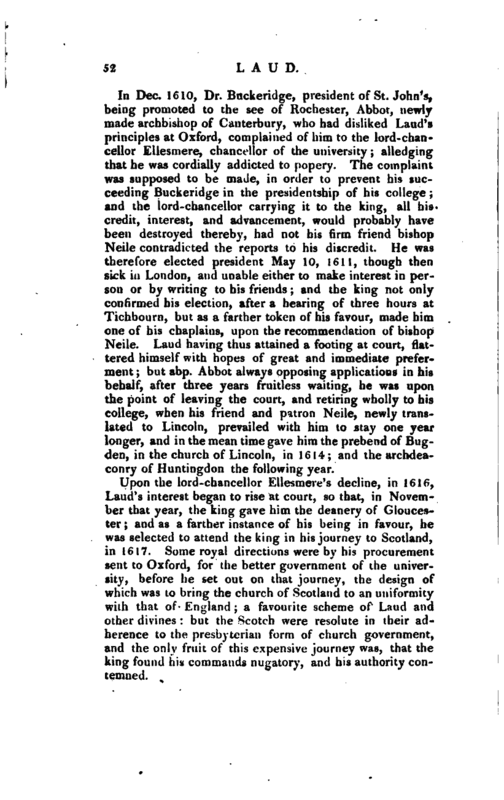 The complaint was supposed to be made, in order to prevent his succeeding Buckeridge in the presidentship of his college; and the lord-chancellor carrying it to the king, all his credit, interest, and advancement, would probably have been destroyed thereby, had not his firm friend bishop Neile contradicted the reports to his discredit. He was therefore elected president May 10, 1611, though then sick in London, and unable either to make interest in person or by writing to his friends; and the king not only con finned his election, after a hearing of three hours at Tichbonrn, but as a farther token of his favour, made him one of his chaplains, upon the recommendation of bishop Neile. Laud having thus attained a footing at court, flattered himself with hopes of great and immediate preferment; but abp. Abbot always opposing applications in his behalf, after three years fruitless waiting, he was upon the point of leaving the court, and retiring wholly to his college, when his friend and patron Neile, newly translated to Lincoln, prevailed with him to stay one year longer, and in the mean time gave him the prebend of Bugden, in the church of Lincoln, in 16 14; and the archdeaconry of Huntingdon the following year. Upon the lord-chancellor Kllesmere’s decline, in 1610, Laud s interest began to rise at court, so that, in November that year, the king gave him the deanery of Gloucester; and as a farther instance of his heing in favour, he was selected to attend the king in his journey to Scotland, in 1617. Some royal directions were by his procurement sent to Oxford, for the better government of the university, before he set out on that journey, the design of which was to bring the church of Scotland to an uniformity with that of England; a favourite scheme of Laud and other divines: but the Scotch were resolute in their adherence to the presbyterian form of church government, and the only fruit of this expensive journey was, that the king found his commands nugatory, and his authority contemned. | Laud, however, seems to have advanced in favour with his majesty, for on his return from Scotland, Aug. 2, 1617, he was inducted to the rectory of Ibstock, in Leicestershire; and Jan. 22, 1620-1, installed into a prebend of Westminster. 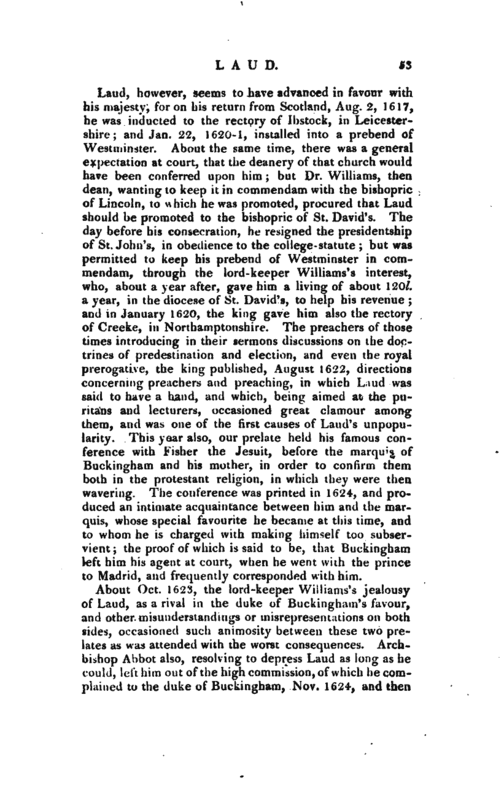 About the same time, there was a general expectation at court, that the deanery of that church would have been conferred upon him; but Dr. Williams, then dean, wanting to keep it in commendam with the bishopric of Lincoln, to which he was promoted^ procured that Laud should be promoted to the bishopric of St. David’s. The day before his consecration, he resigned the presidentship of St. John’s, in obedience to the college-statute; but was permitted to keep his prebend of Westminster in corrimendam, through the lord-keeper Williams’s interest, who, about a year after, gave him a living of about 120l. a year, in the diocese of St. David’s, to help his revenue; and in January 1620, the king gave him also the rectory of Creeke, in Northamptonshire. The preachers of those times introducing in their sermons discussions on the doctrines of predestination and election, and even the royal prerogative, the king published, August 1622, directions concerning preachers and preaching, in which L;iud was said to have a hand, and which, being aimed at the puritans and lecturers, occasioned great clamour among them, and was one of the first causes of Laud’s unpopularity. This year also, our prelate held his famous conference with Fisher the Jesuit, before the marquis of Buckingham and his mother, in order to confirm them both in the protestant religion, in which they were then wavering. The conference was printed in 1624, and produced an intimate acquaintance between him and the marquis, whose special favourite he became at this time, and to whom he is charged with making himself too subservient; the proof of which is said to be, that Buckingham left him his agent at court, when he went with the prince to Madrid, and frequently corresponded with him. 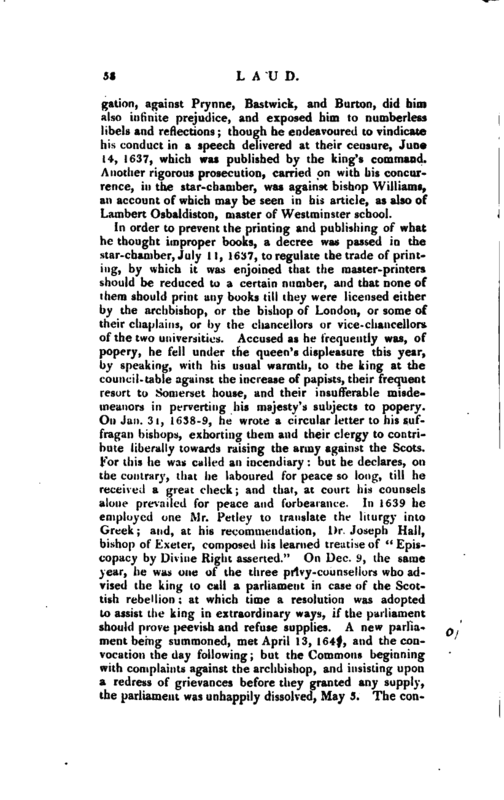 The alteration was said to be this: in that part where the king swears “to maintain the laws,” he added “so far forth as it stands with the prerogative;” or, as it appears in Wharton’s preface, “saving the king’s prerogative royal.” This accusation was renewed by lord chief baron Atkyns, in his speech to the lord mayor, Oct. 1693, with a hint that archbisiop Sancroft had struck out much more from the coronation-oath of James II. Laud vindicated himself at his trial, by having the books of the coronation of king James I. and king Charles compared, which were found to agree. A paper was found in the dean’s yard of St. Paul’s to this effect: “Laud, look to thyself; be assured thy life is sought. As thou art the fountain of all wickedness, repent thee of thy monstrous sins before thou be taken out of the world, &c. And assure thyself neither God nor the world can cndure such a vile counsellor, or such a whisperer;” or to this effect. Laud’s Diary, p. 44. | time, he was put into an ungracious office; namely, in a commission for raising money by impositions, which the Commons called excises; but it seems never to have been executed. 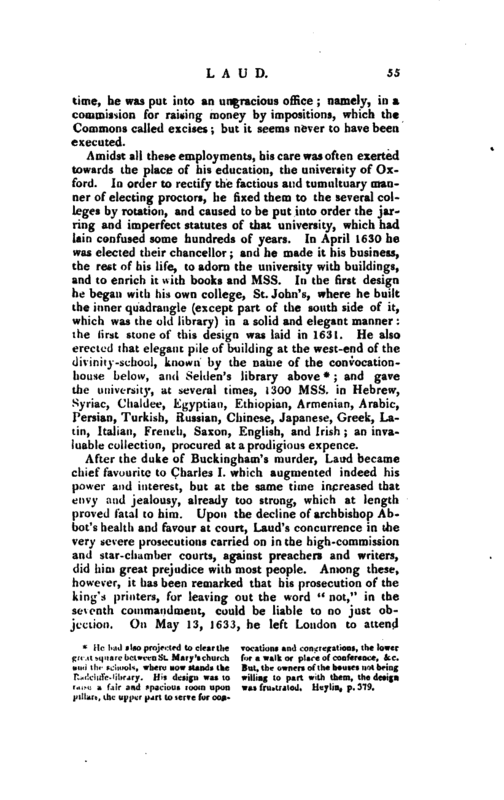 Amidst all these employments, his care was often exerted towards the place of his education, the university of Oxford. In order to rectify the factious and tumultuary manner of electing proctors, he fixed them to the several colleges by rotation, and caused to be put into order the jarring and imperfect statutes of that university, which had lain confused some hundreds of years. In April 1630 he was elected their chancellor; and he made it his business, thy rest of his life, to adorn the university with buildings, and to enrich it with books and Mss. In the first design he began with his own ‘college, St. John’s, where he built the inner quadrangle (except part of the south side of it, which was the old library) in a solid and elegant manner: the first stone of this design was laid in 1631. He also erected that elegant pile of building at the west-end of the divinity-schooL known by the name of the convocationhouse below, and Selclen’s library above *; and gave the university, at several’ times, 1300 Mss. in Hebrew, Syriac, Chaldee, Egyptian, Ethiopian, Armenian, Arabic, Persian, Turkish, Russian, Chinese, Japanese, Greek, Latin, Italian, French, Saxon, English, and Irish; an invaluable collection, procured at a prodigious expence. He had also projected to cleart the great square between St. Mary’ church and the schools, where now stands the Radcliffe-library. His design was to raise a fair and spacious room upon pillars, the upper part to serve for con vocations and congregations, the lower for a walk or place of conference, &c. But, the owners of the houses not being willing to part with them, the design was frustrated. Heylin, p. 379. 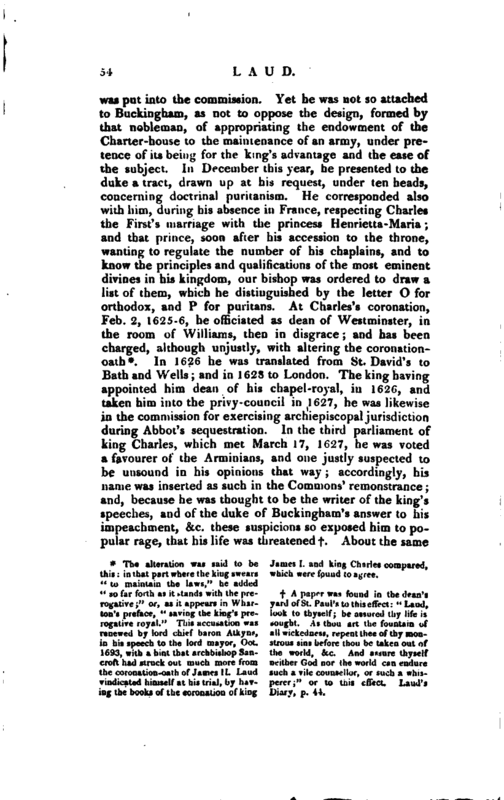 | the king, who was about to set out for his coronation in Scotland, and was sworn a privy-counsellor of that kingdom, June 15, and, on the 26th, came back to Fulham. 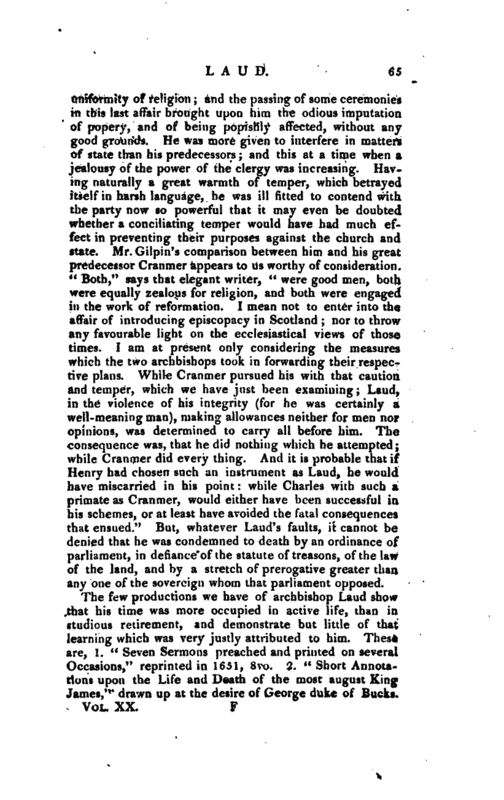 During his stay in Scotland he formed a resolution of bringing that cnurch to a conformity with the church of Englan I; but the king committed the framing of a liturgy to a select number of Scottish bishops, who, inserting several variations from the English liturgy, were opposed strenuously but unsuccessfully, by Laud. Having endeavoured to supplant Abbot, “whom,” as Fuller observes in his Church History, “he could not be contented to succeed,” upon his death in August this year,‘ he was appointed his successor. That very morning, August 4, there came one to him at Greenwich, with a serious offer (and an avowed ability to perform it) of a cardinal’s hat; which offer was repeated on the 17th; but his answer both times was, “that somewhat dwelt within him which would not suffer that till Home were other than it is.” On Sept. 14 he was elected chancellor of the university of Dublin. One of his first acts, after his advancement to the archbishopric, was an injunction, October 18, pursuant to the king’s letter, that no clergyman should be ordained priest without a title. At the same time came out the king’s declaration about lawful sports on Sundays, which Laud was charged with having revived and enlarged; and that, with the vexatious persecutions of such clergymen as refused to read it in their churches, brought a great odium upon him. It was in vain that he pleaded precedents in foreign churches; and perhaps no act of this unhappy reign gave a more violent shock to the loyalty of the people, which Laud, unfortunately, seldom consulted. Soon after he yet farther interfered with popular prejudices." During a metropoliticul visitation, by his vicar-general, among other regulations, the church-wardens in every parish were enjoined to remove the communion-table from the middle to the east end of the chancel, altar-wise, the ground being raised for that purpose, and to fence it in with decent rails, to avoid profaneness; and the refusers were prosecuted in the high-commission or star-chamber courts. In this visitation, the Dutch and Walloon congregations were summoned to appear; and such as were born in England enjoined to repair to the several parish-churches where they inhabited, to hear divine service and sermons, and perform all duties and payments required on that behalf; and those | of them, ministers and others, that were aliens born, to use the English liturgy translated into French or Dutch; but many of these, rather than comply, chose to leave the kingdom, to the great detriment of our manufactures. As Cottington was the most artful cuurtier that perhaps any time has produced, Laud’s open honesty was an easy prey to him. An instance of this, with regard to the first enclosing of Richmond park, and which they both agreed to dissuade his Majesty from attempting, may be seen in Clarendon’s Hist. of the Rebellion. 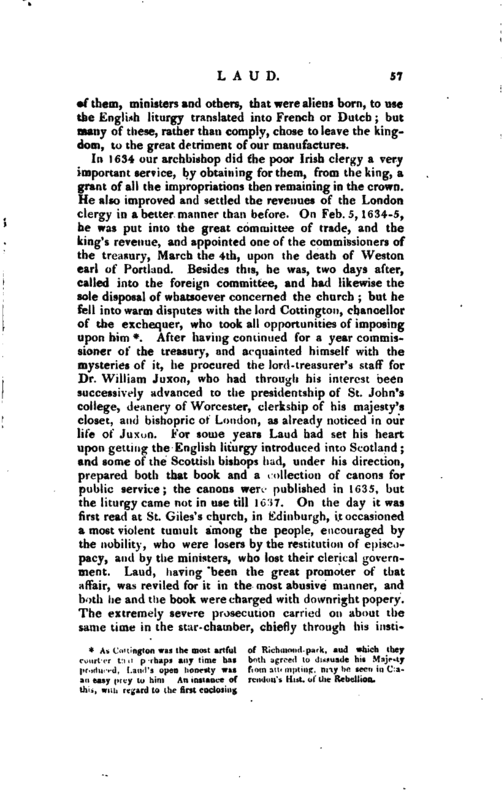 After having continued for a year commissioner of the treasury, and acquainted himself with the mysteries of it, he procured the lord-treasurer’s staff" for Dr. William Juxon, who had through his interest been successively advanced to the presidentship of St. John’s college, deanery of Worcester, clerkship of his majesty’s closet, and bishopric of London, as already noticed in our life of Juxon. For some years Laud had set his heart upon getting the English liturgy introduced into Scotland; and some of the Scottish bishops hud, under his direction, prepared both that book and a collection of canons for public service; the canons were published in 1635, but the liturgy came not in use till 1637. On the day it was first read at St. Giles’s church, in Edinburgh, it occasioned a most violent tumult among the people, encouraged by the nobility, who were losers by the restitution of episcopacy, and by the ministers, who lost their clerical government. Laud, having been the great promoter of that affair, was reviled for it in the most abusive manner, and both he and the book were charged with downright popery. 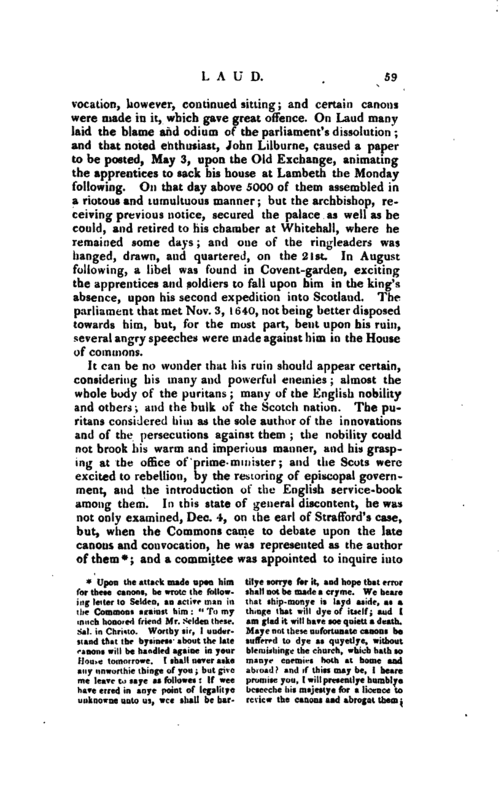 The extremely severe prosecution carried on about the same time in the star-chamber, chiefly through his | instigation, against Prynne, Bastwick, and Burton, did him also infinite prejudice, and exposed him to numberless libels and reflections; though he endeavoured to vindicate his conduct in a speech delivered at their censure, June 14, 1637, which was published by the king’s command. Another rigorous prosecution, carried on with his concurrence, in the star-chamber, was against bishop Williams, an account of which may be seen in his article, as also of Lambert Osbaldiston, master of Westminster school. In order to prevent the printing and publishing of what he thought improper books, a decree was passed in the star-chamber, July 11, 1637, to regulate the trade of printing, by which it was enjoined that the master-printers should be reduced to a certain number, and that none of them should print any books till they were licensed either by the archbishop, or, the bishop of London, or some of their chaplains, or by the chancellors or vice-chancellors of the two universities. Accused as he frequently was, of popery, he fell under the queen’s displeasure this year, by speaking, with his usual warmth, to the king at the council- table against the increase of papists, their frequent resort to Somerset house, and their insufferable misdemeanors in perverting his majesty’s subjects to popery. On Jan. 3i, 1638-9, he wrote a circular letter to his suffragan bishops, exhorting them and their clergy to contribute liberally towards raising the army against the Scots, For this he was called an incendiary: but he declares, on the contrary, that he laboured for peace so long, till he received a great check; and that, at court his counsels alone prevailed for peace and forbearance. lu 1639 he employed one Mr. Petley to translate the liturgy into Greek; and, at his recommendation, Dr. Joseph Hall, bishop of Exeter, composed his learned treatise of “Episcopacy by Divine Right asserted.” On Dec. 11, the same year, he was one of the three privy-counsellors who advised the king to call a parliament in case of the Scottish rebellion; at which time a resolution was adopted to assist the king in extraordinary ways, if the parliament should prove peevish and refuse supplies. A new parliament being summoned, met April 13, 1649, and the convocation the day following; but the Commons beginning with complaints against the archbishop, and insisting upon a redress of grievances before they granted any supply, the parliament was unhappily dissolved, May 5. The | convocation, however, continued sitting; and certain canons were made in it, which gave great offence. On Laud many laid the blame and odium of the parliament’s dissolution; and that noted enthusiast, John Lilburne, caused a paper to be posted, May 3, upon the Old Exchange, animating the apprentices to sack his house at Lambeth the Monday following. On that day above 5000 of them assembled in a riotous and tumultuous manner; but the archbishop, receiving previous notice, secured the palace as well as he could, and retired to his chamber at Whitehall, where he remained some days; and one of the ringleaders was hanged, drawn, and quartered, on the 21st. 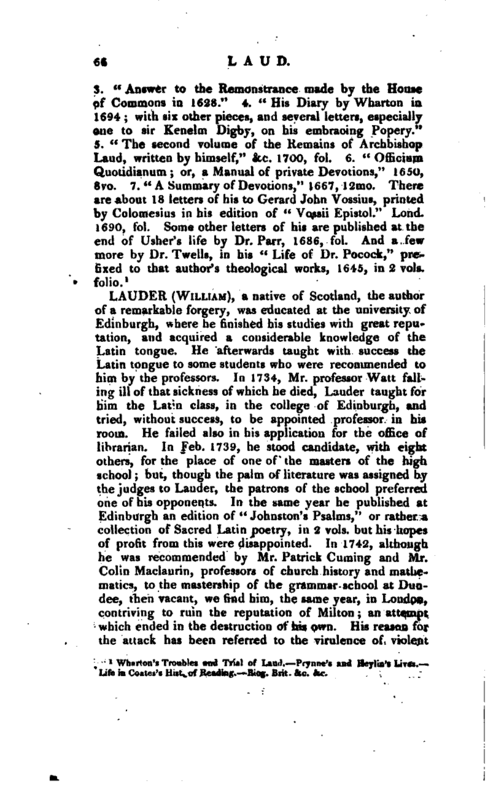 In August following, a libel was found in Covent-garden, exciting the apprentices and soldiers to fall upon him in the king’s absence, upon his second expedition into Scotland. The parliament that met Nov. 3, 1640, not being better disposed towards him, but, for the most part, bent upon his ruin, several angry speeches were made against him in the House of commons. and a committee was appointed to inquire into | all his actions, and prepare a charge against him on the 16th. The same morning, in the House of Lords, he was named as an incendiary, in an accusation from the Scottish commissioners; and, two days after, an impeachment of high-treason was carried up to the lords by Denzil Holies^ desiring he might be forthwith sequestered from parliament, and committed, and the Commons would, in a convenient time, resort to them with particular articles. Soon after, the Scotch commissioners presented also to the upper House the charge against him, tending to prove liim an incendiary, and he was immediately committed to the custody of the black rod. After ten weeks, sir Henry Vane, junior, brought up, Feb. 26, fourteen articles against him, which they desired time to prove in particular, and, in the mean time, that he be kept safe. Accordingly, the black rod conveyed him to the Tower, March 1, 1640-1, amidst the insults and reproaches of the mob. 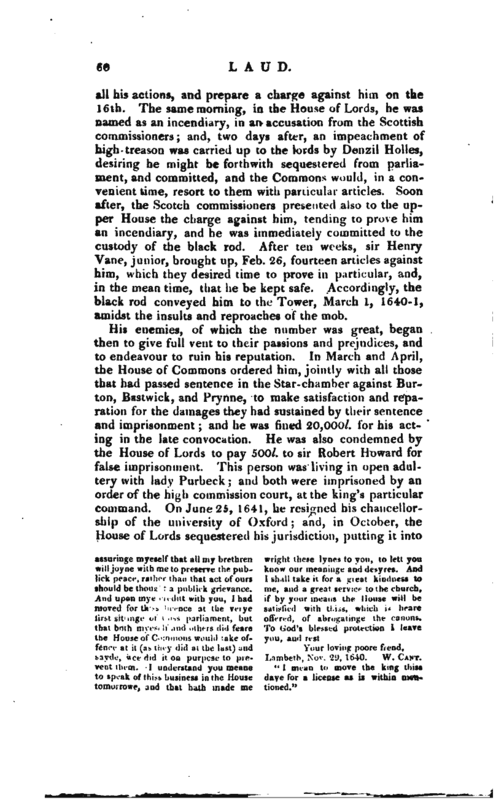 His enemies, of which the number was great, began then to give full vent to their passions and prejudices, and to endeavour to ruin his reputation.‘ In March and April, the House of Commons ordered him, jointly with all those that had passed sentence in the Star-chamber against Burton, Bastwick, and Prynne, to make satisfaction and reparation for the damages they had sustained by their sentence and imprisonment and he was fined 20,000l. for his acting in the late convocation. He was also condemned by the House of Lords to pay 500l. to sir Robert Howard for false imprisonment. 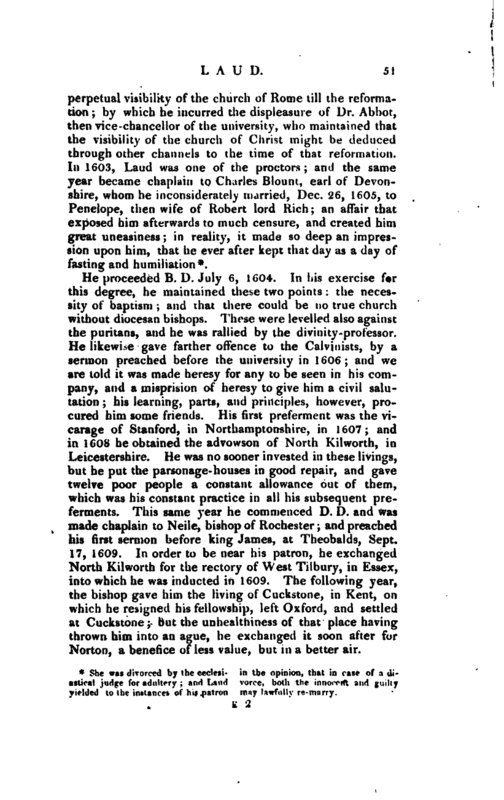 This person was living in open adultery with lady Purbeck; and both were imprisoned by an order of the high commission court, at the king’s particular command. On June 25, 1641, he resigned his chancellorship of the university of Oxford; and, in October, the House of Lords sequestered his jurisdiction, putting it into | the hands of his inferior officers and enjoined, that he should give no benefice without first having the House’s approbation of the person nominated by him. On Jan. 20, 1641-2, they ordered his armoury at Lambeth-palace, which had cost him above 300l. and which they represented as sufficient for 2000 men, to be taken away by the sheriffs of London. 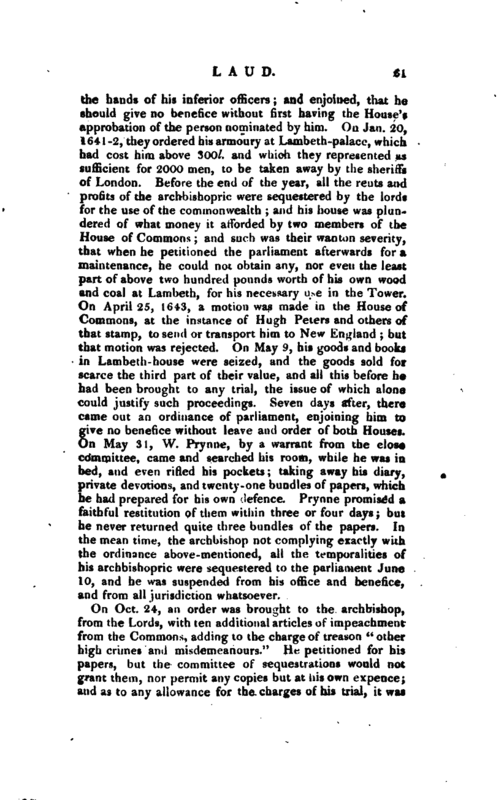 Before the end of the year, all the rents and profits of the archbishopric were sequestered by the lords for the use of the commonwealth; and his house was plunv dered of what money it afforded by two members of the House of Commons; and such was their wanton severity, that when he petitioned the parliament afterwards for a maintenance, he could not obtain any, nor even the least part of above two hundred pounds worth of his own wood and coal at Lambeth, for his necessary use in the Tower. On April 25, 1643, a motion was made in the House of Commons, at the instance of Hugh Peters and others of that stamp, to send or transport him to New England; but that motion was rejected. On May 9, his goods and books in Lambeth-house were seized, and the goods sold for scarce the third part of their value, and all this before he had been brought to any trial, the issue of which alone could justify such proceedings. Seven days after, there came out an ordinance of parliament, enjoining him to give no benefice without leave and order of both Houses. On May 31, W. Prynne, by a warrant from the close committee, came and searched his room, while he was in bed, and even rifled his pockets; taking away his diary > private devotions, and twenty-one bundles of papers, which he had prepared for his own defence. Prynne promised a faithful restitution of them within three or four days; but he never returned quite three bundles of the papers. In the mean time, the archbishop not complying exactly with the ordinance above-mentioned, all the temporalities of his archbishopric were sequestered to the parliament June 10, and he was suspended from his office and benefice, and from all jurisdiction whatsoever. On Oct. 24, an order was brought to the archbishop, from the Lords, with ten additional articles of impeachment from the Commons, adding to the charge of treason “other high crimes and misdemeanours.” He petitioned for his. papers, but the committee of sequestrations would not grant them, nor permit any copies but at his own expence; and as to any allowance for the charges of his trial, it was | insultingly said by Mr.Glyn, “that he might plead in forma pauperis.” At length Mr. Dell, his secretary, was appointed his solicitor, and Mr. Herne, of Lincoln’s-inn, his counsel; and two more servants were sent to him, for his assistance. 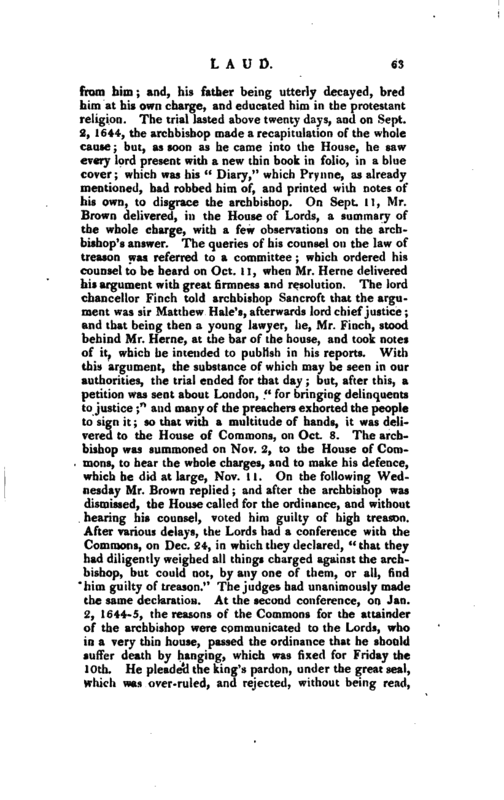 After nearly three years’ imprisonment, on Nov. 13 the archbishop was brought to the bar of the House of Lords, and put in his answer in writing, in this form, “all advantages of law against this impeachment saved and reserved to this defendant, he pleads, not guilty, to all and every part of the impeachment, in manner and form as it is changed in the articles;” and to this answer he then set his hand. He then petitioned that his counsel might be heard, and might advise him, both with regard to law and fact; which was allowed in things not charged as treason. 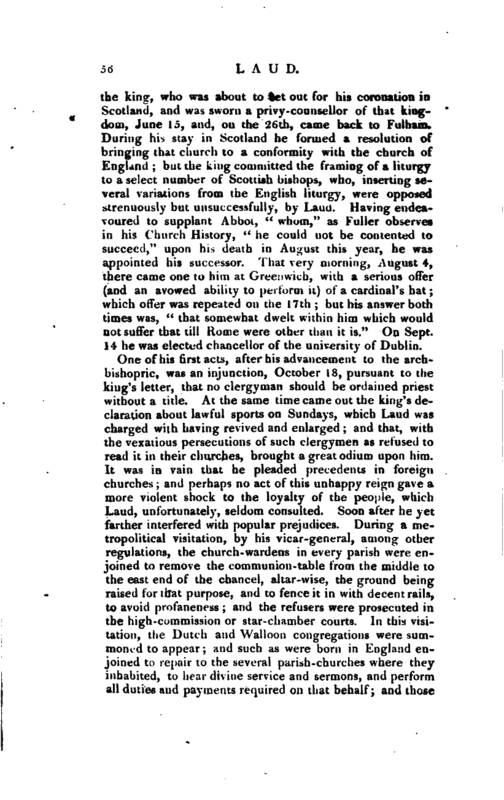 On Jan. 8, there was an order for the archbishop’s appearance; but, at his request, it was postponed to the 16th; when the committee began with the former general articles, to which the archbishop had put in no answer, nor even joined issue: therefore he was peremptorily commanded to put in his answer both to the original and additional articles, in writing; which he did, pleading, in general, not guilty. On Tuesday, March 12, 1643-4, the trial was opened in form; the original and additional articles of impeachment were read, and, after that, the archbishop’s answer, plea, and demurrer to them. 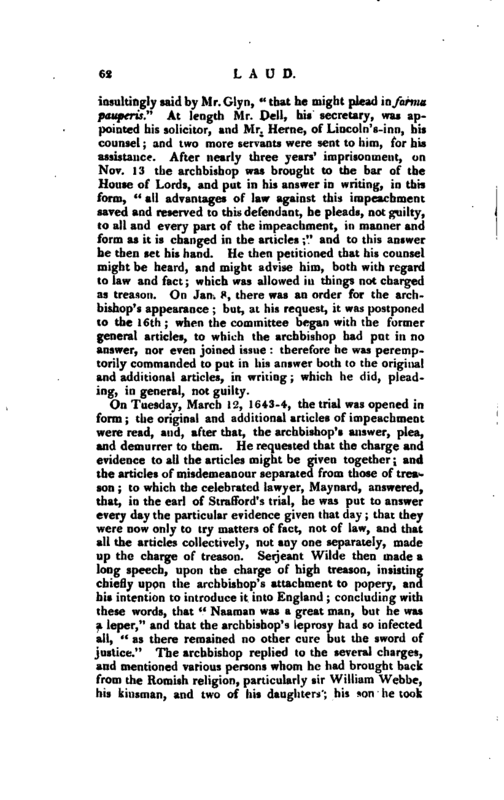 He requested that the charge and evidence to all the articles might be given together; and the articles of misdemeanour separated from those of treason; to which the celebrated lawyer, Maynard, answered, that, in the earl of Strafford’s trial, he was put to answer every day the particular evidence given that day; that they were now only to try matters of fact, not of law, and that all the articles collectively, not any one separately, made up the charge of treason. Serjeant Wilde then made a long speech, upon the charge of high treason, insisting chiefly upon the archbishop’s attachment to popery, and his intention to introduce it into England; concluding with these words, that “Naaman was a great man, but he was a leper,” and that the archbishop’s leprosy had so infected all, “as there remained no other cure but the sword of justice.” The archbishop replied to the several charges, and mentioned various persons whom he had brought back from the Romish religion, particularly sir William Webbe, his kinsman, and two of his daughters; his son lui took | from him; and, his father being utterly decayed, bred him at his own charge, and educated him in the protestant religion. The trial lasted above twenty days, and on Sept. 2, 1644, the archbishop made a recapitulation of the whole cause; but, as soon as he came into the House, he saw every lord present with a new thin book in folio, in a blue cover; which was his “Diary,” which Prynne, as already mentioned, had robbed him of, and printed with notes of his own, to disgrace the archbishop. On Sept. 11, Mr. Brown delivered, in the House of Lords, a summary of the whole charge, with a few observations on the archbishop’s answer. The queries of his counsel on the law of treason was referred to a committee which ordered his counsel to be heard on Oct. 11, when Mr. Herne delivered his argument with great firmness and resolution. The lord chancellor Finch told archbishop Sancroft that the argument was sir Matthew Hale’s, afterwards lord chief justice; and that being then a young lawyer, he, Mr. Finch, stood behind Mr. Herne, at the bar of the house, and took notes of it, which he intended to publish in his reports. With this argument, the substance of which may be seen in our authorities, the trial ended for that day; but, after this, a petition was sent about London, “for bringing delinquents to justice;” and many of the preachers exhorted the people -to sign it; so that with a multitude of hands, it was delivered to the House of Commons, on Oct. 8. The archbishop was summoned on Nov. 2, to the House of Commons, to hear the whole charges, and to make his defence, which he did at large, Nov. 11. On the following Wednesday Mr. Brown replied and after the archbishop was dismissed, the House called for the ordinance, and without hearing his counsel, voted him guilty of high treason. After various delays, the Lords had a conference with the Commons, on Dec. 24, in which they declared, “that they had diligently weighed all things charged against the archbishop, but could not, by any one of them, or all, find him guilty of treason.” The judges had unanimously made the same declaration. At the second conference, on Jan. 2, 1644-5, the reasons of the Commons for the attainder of the archbishop were communicated to the Lords, who in a very thin house, passed the ordinance that he should suffer death by hanging, which was fixed for Friday the 10th. He pleaded the king’s pardon, under the great seal, which was over-ruled, and rejected, without being read, | and the only favour granted, and that after delay and with reluctance, was, that his sentence should be changed to beheading. The archbishop continued a journal of all the circumstances of his trial and imprisonment to January 3; but on hearing that the bill of attainder had passed the Lords, be broke off his history, and prepared himself for death. He received the notice with great composure, and passed the time between his sentence and execution, in prayer and devout exercises. 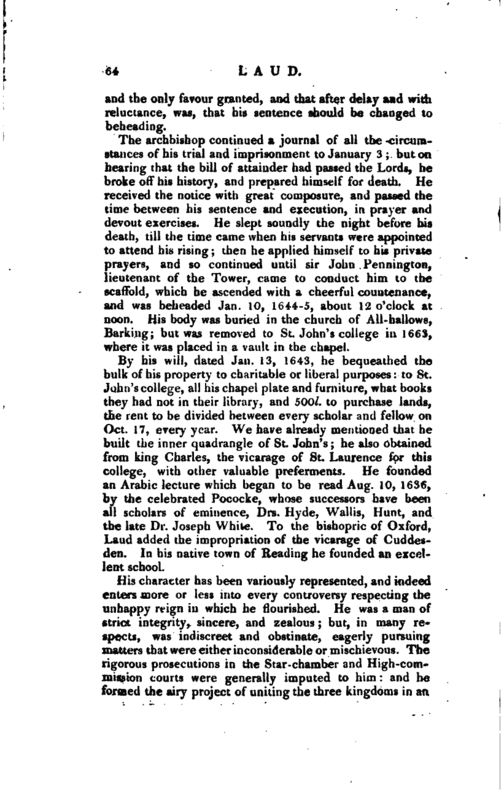 He slept soundly the night before his death, till the time came when his servants were appointed to attend his rising; then he applied himself to his private prayers, and so continued until sir John Pennington, lieutenant of the Tower, came to conduct him to the scaffold, which he ascended with a cheerful countenance, and was beheaded Jan. 10, 1644-5, about 12 o’clock at noon. His body was buried in the church of All-hallows, Barking; but was removed to St. John’s college in 1663, where it was placed in a vault in the chapel. By his will, dated Jan. 13, 1643, he bequeathed the bulk of his property to charitable or liberal purposes: to St. John’s college, all his chapel plate and furniture, what books they had not in their library, and 500l. to purchase lands, the rent to be divided between every scholar and fellow on Oct. 17, every year. We have already mentioned that he built the inner quadrangle of St. John’s; he also obtained from king Charles, the vicarage of St. Laurence for this college, with other valuable preferments. He founded an Arabic lecture which began to be read Aug. 10, 1636, by the celebrated Pococke, whose successors have been all scholars of eminence, Drs. Hyde, Wallis, Hunt, and the late Dr. Joseph White. To the bishopric of Oxford, Laud added the impropriation of the vicarage of Cuddesden. In his native town of Reading he founded an excellent school. His character has been variously represented, and indeed enters more or less into every controversy respecting the unhappy reign in which he flourished. He was a man of strict integrity, sincere, and zealous; but, in many respects, was indiscreet and obstinate, eagerly pursuing matters that were either inconsiderable or mischievous. The rigorous prosecutions in the Star-chamber and High-commission courts were generally imputed to him: and he formed the airy project of uniting the three kingdoms in an | uniformity of religion and the passing of some ceremonies in this last affair brought upon him the odious imputation of popery, and of being popishly affected, without a,ny good grounds. He was more given to interfere in matters of state than his predecessors; and this at a time when a jealousy of the power of the clergy was increasing. Having naturally a great warmth of temper, which betrayed itself in harsh language, he was ill fitted to contend with the party now so powerful that it may even be doubted whether a conciliating temper would have had much effect in preventing their purposes against the church and state. Mr. Gilpiu’s comparison between him and his great predecessor Cranmer appears to us worthy of consideration. “Both,” says that elegant writer, “were good men, fypth were equally zealous for religion, and both were engaged in the work of reformation. I mean not to enter into the affair of introducing episcopacy in Scotland; nor to throw any favourable light on the ecclesiastical views of those times. I am at present only considering the measures which the two archbishops took in forwarding their respective plans. While Cranmer pursued his with that caution and temper, which we have just been examining; Laud, in the violence of his integrity (for he was certainl^ a well-meaning man), making allowances neither for men nor opinions, was determined to carry all. before him. The consequence was, that he did nothing which he attempted; while Cranmer did every thing. And it is probable that if Henry had chosen such an instrument as Laud, he would have miscarried in his point: while Charles with such a primate as Cranmer, would either have been successful in his schemes, or at least have avoided the fatal consequences that ensued.” But, whatever Laud’s faults, itcannot.be denied that he was condemned to death by an ordinance of parliament, in defiance of the statute of treasons, of the law of the land, and by a stretch of prerogative greater than any one of the sovereign whom that parliament opposed. 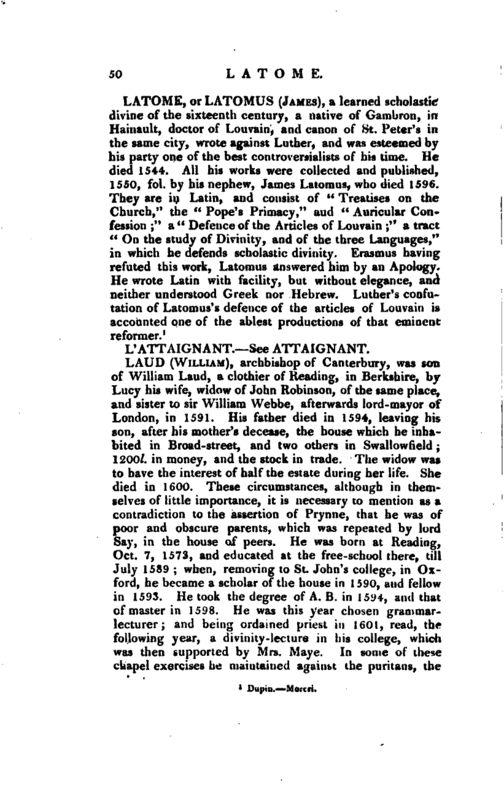 Wbarton’s Troubles and Trial of Laud.—Prynne’s and Heylin’s Lives.— Life in Coates’s Hist. of Reading.—Biog. Brit. &c. &c.